We love The Great Lake! Have you ever been in love? Off course! We too, and off course, still are. 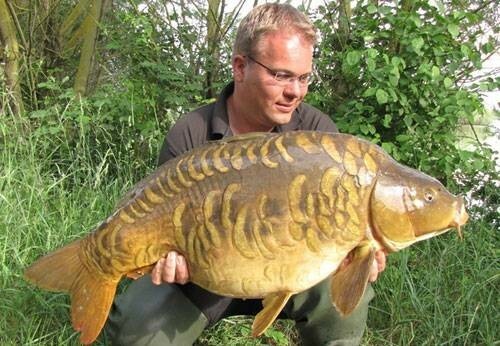 Next to our girlfriends, The Carp Specialist has got a second love, one which she secretly really adores. A love you dream about, you can't get it out of your head and it is mutual and eternal. This might sound light and poetic, but the charm of The Great Lake and the beautiful patterned fish which swim there has captivated a lot of carpers. In 2010 we have fished there ourselves once again, and (besides a very big sturgeon) we haven't caught anything. Love hurts, you can say that again! This water is everything but easy because of all the weed, the crystal clear water and the fish who are very aware. Next to that, the stock isn't really big, about 50 acres, we estimate the stock on about 300 carp, this could be less though. What is special about these fish, is that they have lots of scales and an enormous variety of patterns to recognize the fish. A stock to love and annually lots of die-hard carpers will visit this lake to test their luck. We keep trying too: often with success, but just as often without any catches at all. To give ourselves and the angler a good picture of the real stock of The Great Lake, we have put all the pictures which we received the last years together, and as a tribute to The Great Lake, we have turned them into a movie. Lots of fun watching the movie! The video is made with all of our thanks to all the carpers who wanted to share their pictures of their catches at The Great Lake with us!